1. Soften the ice cream slightly, if necessary, until it’s easy to scoop. 2. Top one wafer with about 2 tablespoons of ice cream. Put another wafer on top (press down easy so you don’t crack the wafer) to spread out the ice cream. 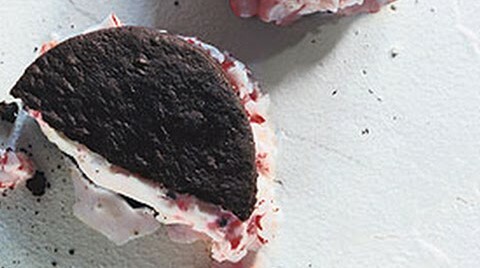 Spread the sides of the ice cream sandwich with a knife. 3. Place a little of the crushed candy canes around the ice cream bite. Place in the freezer. 4. Continue making as many bites as desired and place in the freezer. 5. Freeze for at least two hours to firm. When firm, wrap each in plastic wrap and store in the freezer. 6. Peppermint Ice Cream Bites can be made several days in advance.